CHIBOK, Nigeria — The leader of a notorious Islamic terrorist group has threatened to sell over 200 kidnapped girls into slavery at the command of Allah, reports state. Boko Haram had stormed an all-girls secondary school in Chibok, Borno State last month, kidnapping 276 students while they were taking their final exams. Over 50 girls later escaped, but more than 200 remain missing. She stated that she and others escaped by jumping out of one of the vehicles carrying the students. Nigerian President Goodluck Jonathan has vowed to free the girls and return them to their families, but also notes that the whereabouts of the teen girls are unknown. 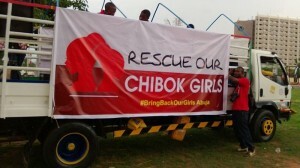 In the meantime, reports surfaced on Tuesday that 11 more girls had been kidnapped in the Northeastern region of Nigeria.